I have often banged on about the advantages of using a tapestry frame for your stitching, the main one being that your work will not distort nearly so much as it will if you stitch it ‘in the hand’. Some people find frames awkward to use and at times I do as well! Especially when starting a new tapestry where I tend to begin at the top. When the tapestry is attached to the frame, the top can be rather high up and you have to stretch across the canvas to stitch the first couple of inches. Stitching is far more comfortable from about the middle of the frame downwards. The good news is that you can stitch the top of the design upside down with no visible effect on the finished tapestry! My mother discovered this as she used to fill in backgrounds of new designs for me. Just turn the whole frame round so that the top is at the bottom and then you can stitch comfortably from there until you have got past those distant areas at the top edge of the design. Below, I’m stitching a prototype of the New Diamond Jubilee tapestry, so the canvas is not printed but that makes no difference. 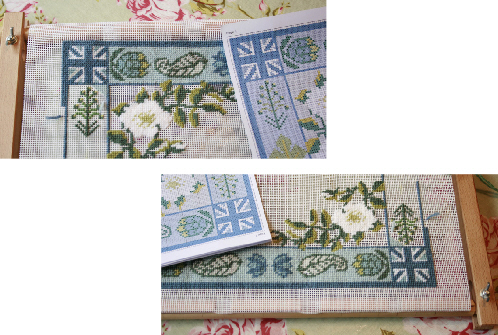 I am also rather more mean with spare canvas for my own stitching – there is far more on all sides in the kits! Of course, if you use a frame, you can’t go wrong but if you stitch in the hand, be very careful if you want to turn the design, that you only swap top to bottom and vice versa. If you turn the work to the side, your stitches will slope the wrong way!